Tornadoes have always been a risk for people living in the midwest; and as a result, the design of wind and debri resistant structures has always been part of the house construction conversation. There have been more technical and more resource intensive design/construction ideas discussed before. However, the reason I chose to do a blog post using this source is because the goal is a design that can resist 250 mph winds and debri using only affordable wood and construction methods. Additionally, the construction process is to be something that uses only basic construction skills. I really like this concept not because this is the perfect solution, but because this is good starting point for people to be reasonably safe. The design is constructed using interlocking timber with plywood overlay and the wood structure is connected to a concrete foundation using bolts. The door is still designed using steel; however, Falk is researching a way to use a wood door. The structure is currently undergoing testing using 2 x 4’s shot at 250 mph. Whatever this design may entail, there needs to be an empirical, repeatable process that can be easily designed and built. 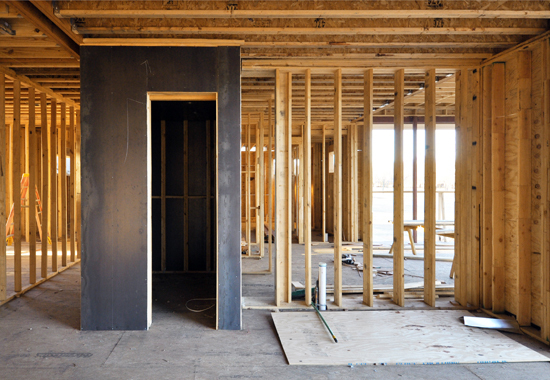 A good plan should include the following at minimum: door frame requirements, bolt spacing requirements along the wall, nail spacing requirements along the plywood and interlocking timber sections, timber grading requirements, concrete foundation requirements, and roof connection requirements. As far as wind is concerned, one critical issue is the door and the frame around the door. And especially after reading this article, it came to my attention because nothing is mentioned about the study of the frame. The design uses a steel door, so the door shouldn’t be the issue in that case. However, if the frame can’t resist the winds in the the hinge and bolt system and the wall/frame connection around the door the door system, it will fail to resist the loads. Some basic wind tunnel testing should be a good starting point. The walls shouldn’t be the critical part of the wall if this is constructed as it says. Yes, would splinters and could be dangerous; however, if the testing is occurring as described and enough strength is provided based on these studies the walls shouldn’t splinter. However, there will be some very high shear and moment loads on the bolts. If not adequately tested and designed, the wall could break of along the foundation. I would argue that this even more critical as well since it would affect a whole section of wall, so I believe details need to be examined here. With the increased wind, the uplift forces on this structure will be very high. Furthermore, I believe this has to be designed as an independent structure as well as a structure that is part of a larger building. With this in mind, uplift forces applied to the whole structure of the second floor or roof needs to be considered as well. Connections at the top of the wall need to be able to resist that full load or design needs to allow for relief of those forces if the house breaks around the shelter. Either way, study and wind tunnel tests are required for a safe design. What is your opinion on the shelter mentioned in the article? Do you agree my assessment of the design? Is there anything I missed? Please share this post if you enjoyed it and have a good week! Hello everyone! I hope y’all are doing well. I’m almost done with grad school and looking forward to that. Other than that, nothing much has happened. Today, I would like to discuss a recent development in concrete roofing for remote areas. Scott Hamel, a faculty member of UAA (University of Alaska Anchorage), has developed a concrete roofing tile that can be used in place of cast in place concrete roofs. While working with Habitat for Humanity in Port-au-Prince, Haiti, Hamel noticed that the prefered method of roofing is a cast in place concrete slab because it can double as a second floor if needed and was more resistant to the wind and elements. However, these roofs weren’t adequately designed in regards to seismic issues and this caused a lot of trouble in the Haiti earthquake of 2010. Additionally, the usual method for constructing these roofs is to carry up the concrete manually to fill the form work for the roof which is highly labor intensive. These two combined issues lead him to create an innovative new system for creating concrete roofing. It is concept that was widely used when making clay roofing tiles up until the 1950’s when improved techniques become more common. He created a “thin shell, latex modified concrete barrel roof unit” – curved concrete roofing tile in which latex from old paint is added to create to increase flexibility. To build the concrete shell unit, a mold was designed and the modified concrete is poured in to the mold with mesh metal reinforcement located in the center of the cross section. Testing is being conducted to determine the optimal shape in regards to stresses and construction applications. There are several benefits to using this type of roofing system. The main one is ease of construction in my opinion. The roof tiles can be made on site on the ground or off site and easily be taken up a ladder to be put together on the roof. Another benefit is the cost; according the article the tile will cost $2 – $3 per a square foot versus $6 – $10 per a square foot for cast in place concrete. The other benefit I find very useful that isn’t mentioned in the article is that it is easily repeatable. Someone with very little experience can build a safe roof and when there is a crisis like a natural disaster a large quantity of these concrete tiles can be built very efficiently on a larger scale as well. Do you think this would be a good roofing system for a remote area? What if any issues do you foresee? Are there any other applications this could be useful for as well? Thanks for your time and have a good week! Hello. How is everyone doing? Today I would like to discuss the statistical breakdown of the benefits in project pricing BIM modeling can provide for the head contractors and subcontractors involved in the design process. BIM modeling is something that is collectively touted by most innovators in the building and infrastructure design/build field. However, it would be helpful to understand who has the most motivation to implement improved BIM modeling. As stated by David Mitchell, “For different types of projects the people you need to engage, changes. We need to acknowledge that the savings arising out of a building project differs significantly to those of a civil or resource project. There also needs to be an appreciation of when a construction contract or subcontract is formed as well as the type of construction contract that has been entered into.” Therefore, the issue is approached in regards to those factors. For a commercial scale building project, the indirect cost such as design and overhead management amounts to 17% as compared to 83% for the construction costs. In addition, the ratio of margins between subcontractors and contractors is 7 to 1. Therefore, it benefits the subcontractors the most to apply the BIM modeling. However, when a civil project is considered, the head contractor sees most of the benefits because subcontractors only control 17% of the costs. The resource sector has some interesting statistics as well. First of all, for a pipeline, the indirect cost is far greater at 45% of the cost going to head contractors. In addition, the head contractor owns the material production plant/labor and the resulting cost accounts for 83% percent of the other 55% which amounts to an additional 46% of the direct cost and 91% of the overall cost. Therefore, in this case, the head contractor holds a large portion of the cost control. However, when building a refinement plant there are some critical differences. There is a similar level of indirect cost cost at 45%, but the subcontractor sees 88% of the direct cost in this case. The result is the subcontractor seeing 48% of the cost of the project as compared to 9% in the previous example. The above statistics are interesting for several reasons. The first one, as stated in the article, is the fact that BIM modeling is implemented by head contractor and other associated designers; yet in some cases, the subcontractors see the benefits. Seeing as changes in pricing are based on estimation based on previous projects, pricing benefits aren’t planned for in the budget as efficiently, and, depending on the project and head contractor, a subcontractor could see large and consistent benefits. This means that the benefits of using BIM might not be maximized aside from time and documentation for the head contractor in that situation. And if it is a case where head contractors see a large amount of the cost savings, they can more readily pass along the cost saving of BIM modeling. But the subcontractors may not be motivated to help improve the BIM modeling because it doesn’t help their bottom line. For both of these reason, it makes sense why it is most common for head contractors and designers to push for improvements and BIM modeling. However, an often overlooked requirement is that the subcontractor needs to work with the head contractor in implementing the improvements and have proper motivation to pass along the savings the see the full benefit for everyone involved with the project. What is your opinion on BIM model implementation in regards to subcontractors and head contractors? Are there any ways to promote a shared interest in BIM modeling? Thanks for your time and have a good week! Hello everyone, I hope y’all had good weekend. Today, I want to talk about some new building materials being researched that are biological produced in a replicable process. One of the common characteristics is that these materials will involve bacteria or something else derived from organisms. The fact that these materials don’t require significant carbon output is one major benefit. Another benefit for most of these materials is that they are actively reproduced over time once they are installed as well. The building materials are described below with some insight on possible benefits and issues. The bioMason brick is a brick of sand and cementitious material in which the cementitious material is created using a bacteria. The brick mixture is created and over the course of 5 days the bacteria solidifies into a coral type material with the strength of a normal brick. The major benefit for this innovation is that it doesn’t require the heat and raw materials used in creating normal bricks; this reduces the cost of the brick by 40%. They are currently conducting experiments to research bacteria creation using the following materials: urea, salt and yeast extracts, and seawater. I see this having one major benefit – it would not significantly change the design and build process for masonry. Masonry strength is mostly determined by the strength of the mortar as long as the masonry unit strength doesn’t change significantly. The benefits of the bioMason bricks combined with the low technology change requirement makes this much more effective. This is a stiff insulation material using plant stalks and husks combined with Mycelium. There are two forms of application being tested currently: growth inside the wall and spray on insulation. The insulation is fire resistant and fully compostable. Additionally, it does not contain formaldehyde or any other harmful organic materials. This same material can also be used as compostable packaging material. There are several benefits to this material. Like before there is no significant change to the other building processes related to it. It also has great applications outside of this usage alone and is completely compostable once it is not needed anymore. The only drawback I can potentially see is there being an organic material harmful to humans that is unknown as of yet – similar to what happened with Asbestos. It has great potential overall though – it is my recommendation that more health testing be done before large scale usage. Research is being conducted on a bacteria that can be used to repair concrete as it ages. Bacteria engineered to thrive in dry climates is being created to be placed in the concrete mixture. The bacteria would release Calcium Carbonate as part of the waste process which would fill the holes and cracks over time. There is one possible major benefit I see – the reduction in maintenance required for the concrete designed this way. However, more research would be required to determine it’s efficiency. Additionally, nothing is mentioned about resources and energy required to produce this bacteria; if it requires a high amount of energy and time/raw material resources, it may become impractical to use. I might also add that the issue of infection might come up here as well; but if the claim is true that it is bacteria that thrives in dry climates, the danger to living organisms would be greatly reduced. What is your opinion on these possible advancements? Can you see them being used in the future? Thank you for your time and have a good week! Hello everyone, I hope y’all are doing well. I’ve taken a bit of a vacation, both literally for a weekend, and then for longer in regards to my blog. I feel guilty but it just felt like the right time to do something like this. Nothing else new has really been going on with me – still just looking for work as an engineer and keeping my resume up to date. I have taken the time to really learn Revit which should help me and my next big to do list in regards to personal learning is getting sharp on AutoCAD again. One fun thing is that I’m also working harder on getting my Spanish to a conversational level, it would really be nice if I could put that on my resume too although not as important. I will also start working as a substitute teacher again and I hope that won’t cut into my job hunt and personal job training right now. We’ll see how that goes. Anyways, that’s about all as far as updates go – today, I want to talk about the recent Hyperloop Alpha Proposal published by Elon Musk (founder of Paypal, SpaceX and Tesla Motors). It has created quite the stir in the engineering community and I thought it would be a good topic to come back on. For this blog post, I am going to reference Elon Musk’s Hyperloop Alpha Proposal (http://bit.ly/16LCXwt). However, this is a complex enough idea with enough attention that I might do some more detailed analysis in another blog post. 1. More expansion on the control mechanism for Hyperloop capsules, including attitude thruster or control moment gyros. 2. Detailed station designs with loading and unloading of both passenger and passenger plus vehicle versions of the Hyperloop capsules. 3. Trades comparing the costs and benefits of Hyperloop with more conventional magnetic levitation systems. They go on to say that Elon Musk has addressed the issue that testing and further research is required, but that some blow back has come his way for that. The article then goes on to share some thoughts Ted Zoli of HNTB, National Chief Bridge Engineer. ““Just the substructure costs alone for elevated structure over the entire length of the alignment is enormous,” says Ted Zoli, national bridge chief engineer at HNTB. The hyperloop’s proposed design requires elevated piers every 100 ft. Zoli says if the structure was built instead at grade, the construction costs could be “sharply reduced.” He adds that it conceivably could be built at grade for much of the route, “particularly if it is in the median of I-5,” which is where Musk envisions much of the transit tube being placed. In closing, a final addition to the list of concerns is added in reference to another comment by Ted Zoli. “5. A closer look at expansion joints. In my opinion, there will be several critical issues if this is pursued. The main one is the tube system in regards to column supports or on grade and expansion and contraction joints. Given the high portion of the budget it involves, the high maintenance cost, even if it is designed well, could make it infeasible. That combined with the earthquake and dynamics issues make that the most critical issue. Another possible issue is testing – this is a system that has never been used on this scale before and would need significantly more testing and research to make a final decision, both of which cost money and won’t magically happen overnight. And the final issue I see that has not been mentioned in the article at all is the reticence of the government to use unproven systems. Take a look at how long it has taken to get high speed rail going in California and that is a system that has been proven to work for a couple decades in other countries. Well this post got longer than I expected for my first post back in a while but thanks for reading if you got to this point. What are your thoughts on the Hyperloop? Do you have any concerns about the hyperloop? Do you think this system can realistically be designed and implemented? Thanks for your time and have a good week.